Thu., April 20, 2017, 4 p.m. When: 5-8 p.m. Friday, with a presentation at 5:45 p.m.
Where: Steam Plan, 159 S. Lincoln St. The Steam Plant has become a regular exhibit spot for students. The connection between the iconic downtown building and the students of East Farms Science, Technology, Engineering, Art and Math (STEAM) Magnet School goes back five years. On Friday, students will celebrate their newest installation, a piece that honors those affected by breast cancer. The Steam Plant’s twin stacks were first adorned in pink by LED lights to draw attention to breast cancer in October 2014. 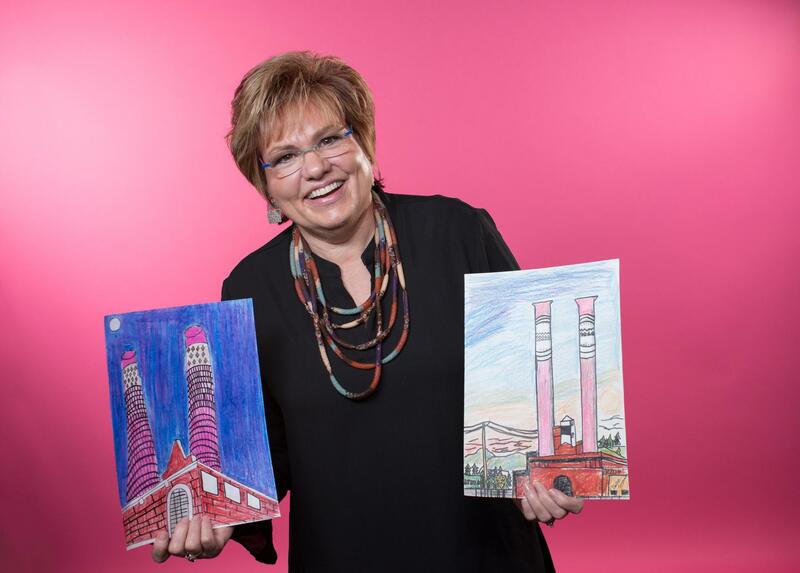 Inch by inch, 415 drawings by 415 students in grades K-6 at the East Farms were digitally compiled into a single photomosaic of the iconic, 100-year-old Steam Plant. Led by Sami Perry, resident artist at East Farms, the project depicts the landmark’s story illuminated in pink light with the power lines and the Spokane valley landscape. The display will remain in the Steam Plant’s main entry off Lincoln Street indefinitely. The piece, titled “Community of Hope,” marks Spokane’s first student public art piece for breast cancer awareness. It’s a testament to community collaboration. Annette Long, an Avista employee who used to work part time at the Steam Plant and is a friend of Perry’s, connected the Steam Plant gallery to East Farm’s student artwork. The Hagan Foundation came on board with a grant, and families shared 121 names of cancer survivors and lost loved ones. As Spokane prepares for its first Pink Ribbon Run on Sunday, it’s appropriate to remember that breast cancer does not stop with the adults affected: Children, families, and communities supporting them all feel the disease’s impact. On Friday children will lead Spokane in the conversation around breast cancer – through postage-sized pictures grouped in a 4-by-6 foot photomosaic. According to the Center for Disease Control, breast cancer is the most common cancer in women, no matter race or ethnicity. National Cancer Institute data shows that about 1 in 8 women will develop breast cancer during her life. And having community support helps. “It can be as simple as ‘I didn’t miss one day at work,’ because coworkers shared leave, and ‘it was parents of my students bringing me meals,’ ” said Dani Wicks, a fourth-grade teacher at East Farms and a cancer survivor. “It was my colleagues here setting up a way for families to donate. Setting up a little envelope box where kids could drop letters so they felt like they could talk to me when they needed to. So, it was that support, that community around you, that made you feel like you could get through it,” said Wicks. The students’ art opened doors to dialogue about hard issues, like breast cancer, and instilled a sense of pride in their own community. “Our kids know that they are artists, and they know how important art is for our community,” said East Farms Principal Tammy Fuller. Public art serves a dual purpose. “A city’s public art can not only be a source of pride for the Spokane community, but it can define the spirit of the city for visitors and tourists,” said Spokane Arts Fund executive director Melissa Huggins. The Community of Hope plants a unifying reminder for healing and connection in Spokane’s center. Published: April 20, 2017, 4 p.m.